IBM® OmniFind™ Analytics Edition uses information in unstructured and structured content to improve decision making. It provides unstructured information analysis, which can improve customer service levels, create cross-sell capabilities and provide early problem detection. IBM® OmniFind™ Analytics gives business users the tools to gain valuable insights, facilitating better business decisions, by exploring and using key information assets in the enterprise. It also provides multiple ways to explore and analyze information; delivers sophisticated entity extraction capabilities when working with unstructured content. It is based on the open Unstructured Information Management Architecture (UIMA) standard. 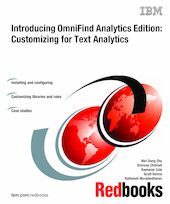 This IBM Redbooks publication will help you understand the power and capability of IBM OmniFind Analytics Edition Version 8.4. The book provides instructions on installing and configuring IBM OmniFind Analytics Edition. It explains how to use it for text mining, and how to work with Dictionary Editor and Rule Editor to customize the application for better analysis and discovery. The book also discusses how to setup the Alerting System for automatically watch for increased unusual activities. The integration with IBM OmniFind Enterprise Edition (OEE) is also covered.